SeeMore Putter has become one of the most popular independent putter manufacturers in the industry. Their unique design and putting system have grown a substantial base of loyal golfers who swear by their products. I had been hearing about them for quite some time and wanted to learn more about what makes them different. Despite plenty of advances in design, technology, and manufacturing processes – most golfers are still purchasing putters that are based on the original Ping Anser design from more than 50 years ago. I am always on the lookout for unique products in the golf world, and SeeMore Putter certainly fits that mold. In this review, I’ll give you a brief understanding of who the company is, what makes their RifleScope Technology different, and my impressions of their putters. 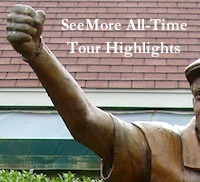 SeeMore Putters was launched in 1998 by golfing professionals in California. Their goal was to make a unique design, which would help a golfer feel confident that they were aligned properly before every putt. It centered around a concept that helps a golfer align the putter using a method similar to aiming a rifle. After several years of research and development, they were able to show their RifleScope technology to the world. Like most new businesses in the golf industry, the first year was spent trying to spread awareness amongst recreational golfers and on the PGA Tour. That same year Payne Stewart had decided that he would go into the 1999 season without an equipment contract after not winning an event in four years. His goal was to fill his bag with 14 clubs that he trusted regardless of the manufacturer’s name. He had heard about SeeMore Putter through several acquaintances and decided to give their putter a shot the week of the AT&T Pebble Beach. Payne was struggling with his putting and believed that an inconsistent forward press was changing his loft and face angle at impact. After getting a brief session on how the SeeMore technology worked, he had only one day to practice before the tournament began. CLICK HERE TO CONTINUE WITH REVIEW. The SeeMore Giant line of putter evolves the classic FGP design with the Mini Giant Deep Flange. A putter I've been dying to test out since I first saw the press release. The new Mini Giant would seem perfect for those golfers looking for a high MOI putter. While size of the Mini GIANT is not as large as most of the other GIANT line this compact look in my option will appeal to a wider range of golfers. Click HERE to continue with fantastic review!! SeeMore putters focus on promoting proper alignment and squaring the putter face by way of their unique RifleScope Technology (RST). The SeeMore Mini GIANT putters are the company’s flagship model, having won three major championships and over 20 Tour events. My new friends at SeeMore sent me a Mini GIANT to test drive, and here are the results. KEY TECHNOLOGY: Nonadjustable copper weights on both ends of the head and sole increase MOI. In 2017, SeeMore is making an effort to keep evolving the “Giant” line of high MOI takes on their classic head shapes with the Mini Giant Deep Flange. While the name itself is a mouthful, the goal is to offer a size/profile that is not as extreme as its Giant brethren, and through that possibly appeal to a wider range of golfers. THP was able to get the new putter in hand and spend a considerable amount of time working with it to take a look not just at the performance, but the actual science and tech that went into it. Click HERE to Continue with Review on THP. Great coverage on the mini Giant DF from The Hackers Paradise - click HERE. KEY TECHNOLOGIES: The "RifleScope" alignment system helps with setup and aim. DISTANCE CONTROL: Very consistent—solid strikes produce a smooth roll and automatic distance; testers tend to drain a lot of mid-length putts. FEEL: One of the best at impact; the TPU insert is absolutely sublime; moderately soft, with a crisp, discernible click; excellent balance in a heavy head. LOOK: The elegant black finish works well with bright white alignment lines along the flange to give the head a slimmer appearance; hide the red and white lines behind the center shaft and you’ll know you’re on the right track.